Winnow Research was thrilled to work with a large, cross-functional team at Kaiser Permanente to shape the “lobby of the future” for very soon-to-be-built medical buildings in Southern California. 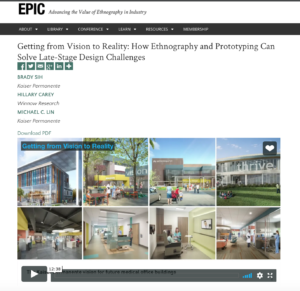 At the EPIC Conference (Ethnographic Praxis in Industry) last October Hillary Carey and Brady Sih presented a piece of the project focused on the conference theme of “evidence.” We talked about how the tangibility of the full-scale, working prototypes helped team and leadership who normally work in silos, and from their functional expertise, collaborate on new solutions through user-centered design. Observe: current patient and worker experience. Rough prototypes: Bodystorm with minimal props and in a simulation space (Oulasvirta 2003). Working prototypes: Transform a current, working medical facility into the format of the future buildings. 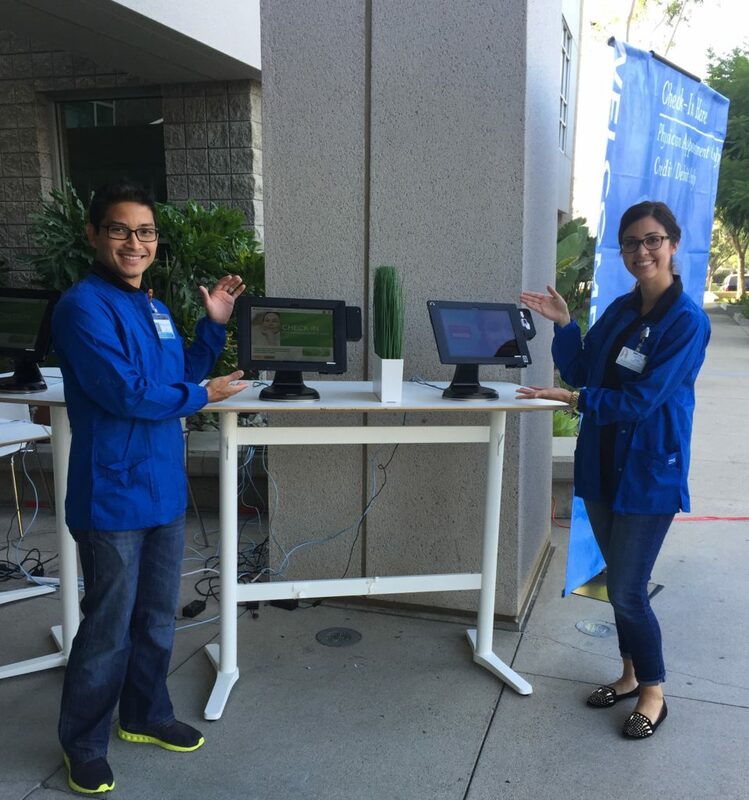 We brought in new furniture, signage, and technology to the building and coached the staff to work in new ways. In this way, we practiced new roles and explored multiple solutions before we worked up to pressure-test our best ideas with staff who had urgent jobs to do and patients who were most concerned with getting to their appointments on time. 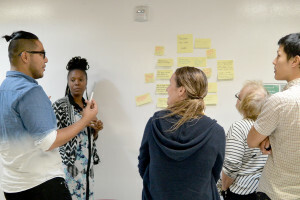 What this project showed us— as a healthcare organization and as design and ethnography practitioners—is that with a growing emphasis on merging digital and physical experiences, there is also a growing need to use ethnography and prototyping to ensure user needs are front and center at every stage of facility design and implementation. These methods to study user experience are particularly important during implementation when multiple systems are being resolved and information is needed about how they will influence each other. And if you are an EPIC People member, you can watch the presentation we gave at the conference. Hillary is reviewing this book because it is an approachable and inspiring academic collection of essays, case studies, and reflections on the emerging field of Design Anthropology. It pushes further beyond the techniques and methods of the first, seminal book to introduce the practice in 2013, “Design Anthropology: Theory and Practice.” Here many of the same contributors dive deeper into the concept of “future” or “multiple futures,” a concept which they propose to be more accurate. This collection shows us that Anthropologists can integrate the collaborative making aspects of Design to move beyond observation of the current state of a society or system and begin to understand what may be possible, plausible and preferable in the future. 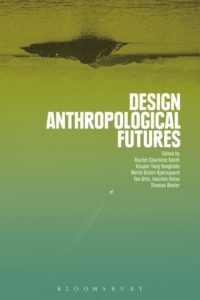 The editors offer, “The approaches presented in this volume are acutely attuned to political issues, socio-economic differences and their effects on future-making practices in situated contexts.” Illustrating how the sensitivities of Anthropological ways of knowing can strengthen our perspectives on how co-designed futures are received by those who interact with them in context. As a practicing design researcher/design thinker in industry, I find this book to be more provocative and philosophical than “Design Anthropology.” The older book was a thoughtful take on how to bring more Anthropological practice into any Design Research practice to level-up your skills. “Design Anthropological Futures” is a handbook for those who are already working on exploring and shaping the future. In Chapter 6, Halse and Boffi describe their methods in this way, “Interventionist speculation blends the techniques of invention with techniques of description; it carries an attitude that oscillates between ‘what is’ and ‘what could be’ (p. 89).” For me, this book is exciting in its thoughtful examination of how to explore future experiences that are more daring and complex than what applied Anthropology is typically working with, and more situated and politically-aware than what Design methods typically extend to. This, to me, is the next generation of tools for exploring big questions in holistic contexts.